Fuel your early riser with the energy for all-day adventure! 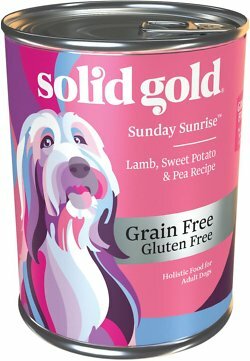 Sunday Sunrise is a delicious, purposefully crafted grain & gluten free meal with fresh grass-fed New Zealand lamb (full of iron and B vitamins), and fiber-rich sweet potato to provide a healthy well balanced diet. Lamb, Whitefish, Lamb Liver, Lamb Broth, Water Sufficient For Processing, Sweet Potatoes, Peas, Carrots, Pea Fiber, Canola Oil, Guar Gum, Alfalfa Meal, Ground Flaxseed, Salt, Cassia Gum, Xanthan Gum, Potassium Chloride, Spinach, Pumpkin, Cranberries, Choline Chloride, Zinc Proteinate, Iron Proteinate, Blueberries, Apples, Thiamine Mononitrate, Vitamin E Supplement, Copper Proteinate, Manganese Proteinate, Sodium Selenite, Cobalt Proteinate, Niacin Supplement, d-Calcium Pantothenate, Vitamin A Supplement, Riboflavin Supplement, Biotin, Vitamin B12 Supplement, Potassium Iodide, Pyridoxine Hydrochloride, Vitamin D3 Supplement, Folic Acid. Feeding amounts are guidelines and may vary. Amount of food your dog requires will depend on activity, age, environment and breed. Feed puppies up to 2 times the recommended feeding amounts. Provide fresh water for your dog at all times. Refrigerate after opening. Feed at room temperature and refrigerate unused portion. 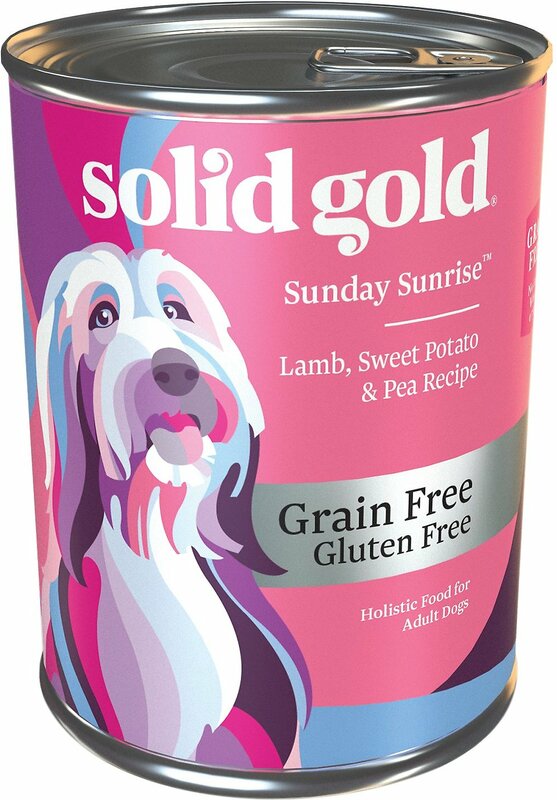 Solid Gold holistic wet dog foods are nutritionally complete and balanced meals, perfect for dogs and puppies of all sizes. The combination of bold flavors and exciting textures makes these delectable formulas filling meals that even the pickiest eaters are sure to love. Supplement your dog's diet with these powerful formulations, packed with antioxidant-rich fruits and vegetables, and necessary vitamins and minerals to keep your pet in peak health. These recipes are designed to support your pet's overall health and well-being—including mind, body and spirit. These recipes boast strong meat aromas and flavors dogs just can't get enough of. And since they contain protein on a dry-matter basis, these wet foods are great for supporting strong, healthy muscles. Available in cans and cups, Solid Gold wet dog foods feature textures and flavors that fit your dog's preferences. With a number of high-quality protein options—including chicken, salmon, turkey, lamb, beef and more—your dog will never get bored. 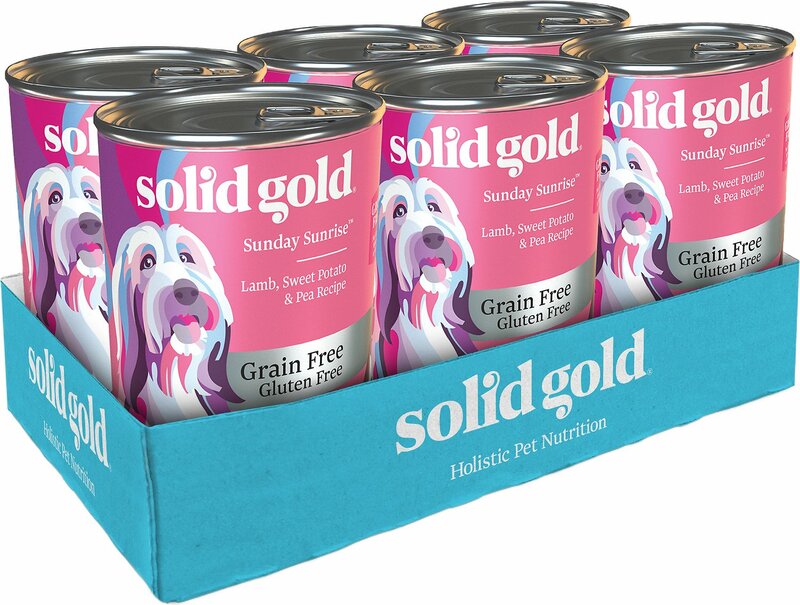 As America's first holistic pet food brand, Solid Gold has led the charge in developing premium pet nutrition for over 40 years. 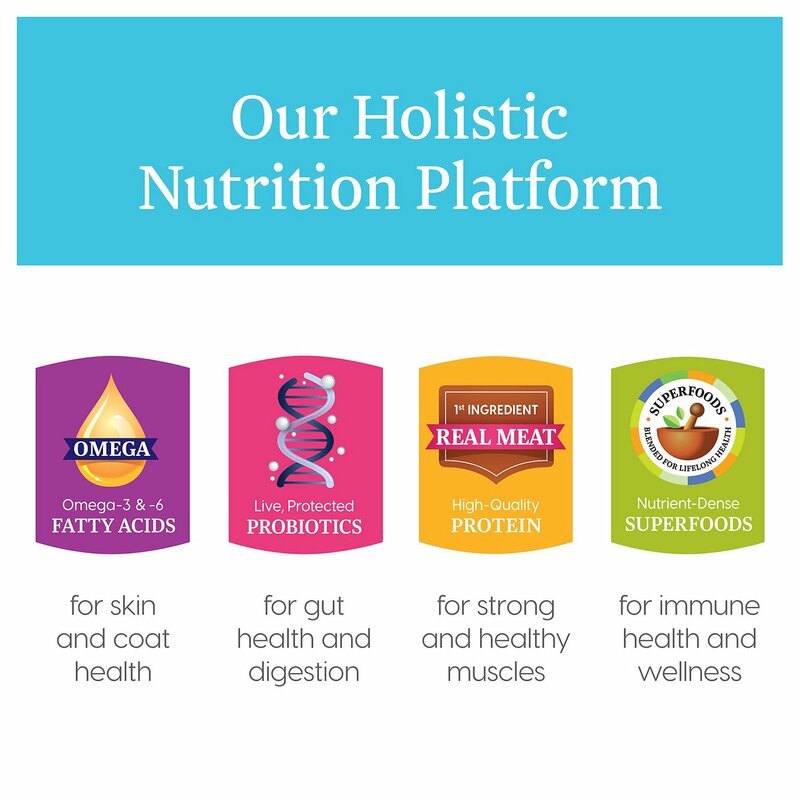 Made up of animal lovers, explorers and nutritionists who want to give the best to their pets and yours, Solid Gold's mission is clear—to produce premium, holistic products that allow pets to look and feel great while living life to the fullest. Neither of my dog will eat this. Smells nasty. It may be good food but if they won't eat it's a waste of money. This is one of the few foods my Chihuahua can eat because he is allergic to chicken. But I was looking for another food because they used carrageenan. I happened to notice that the texture was much better in the new cans I just purchased. It used to be very cakey but now it is moist... much better texture. I looked at the label of ingredients and saw the carrageenan was gone. I am very happy I don't have to try to find another food. Feed the Solid Gold dry food and just a spoonful of the canned. Dogs think they're being spoiled! My pup loves this food! So glad for chewy andthe ease of monthly delivery. I bought it to mix it with dry kibbles & this is too dry & pate-like. The food also tends to get stuck to the sides of the bowl & I often have to help to loosen it for my border collie.